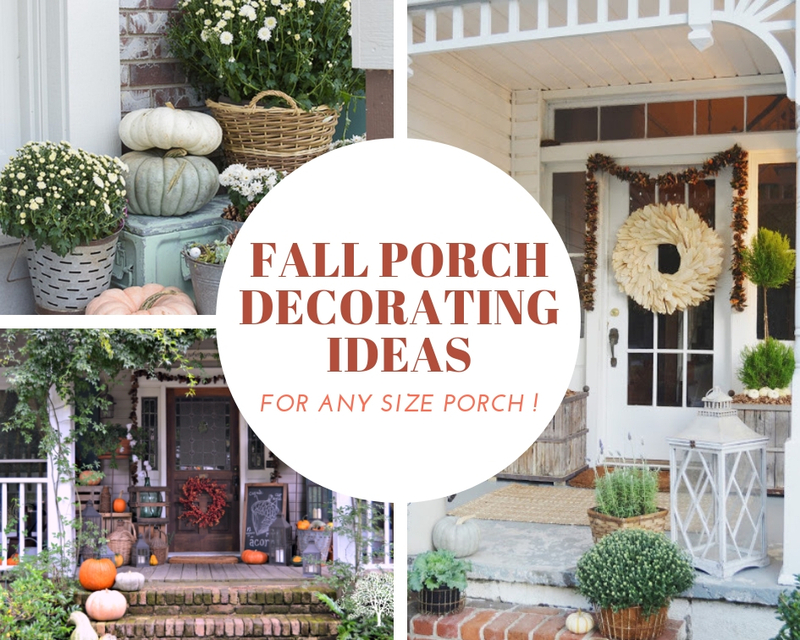 Fall Porch Decorating Ideas for Every Size Porch! September is here and it's time to decorate for the changing seasons! Without a doubt, my favorite area to decorate each year is my front porch and I'm always looking for new ideas and inspirations each year. Below I've rounded up my favorite ideas for decorating your porch, no matter the size. You'll find ideas for decking out small porches, medium porches, and large porches as well, and many ideas that can work for porches of any size. Let me know which ideas you'll be trying and which porches are your favorite! A tall, skinny chalkboard or sign is a great backdrop for a small fall porch vignette. Use items like stools, baskets, hay bales, and crates for stacking and then fill in your holes with pumpkins, gourds, and mums. If you only have space on one side of your stoop for decor, stack items to create different heights and levels throughout your display and to fit the most items in your space! When in doubt keep it simple and symmetrical! All you need for this porch look is a couple of mums, pair of foddershocks, and a wreath! A ladder is another great piece to use on small porches! Adorn it with garland, wreaths, or a sign and stack it behind a row of mums or haybales. Keep it neutral + simple! Use white pumpkins and natural elements to create this minimal look! Extra accessories like the lantern and the small stool balance out the space perfectly. Make use of your steps to fit the most decor on your small porch! Hay bales make a perfect platform for stacking pumpkins or mums and garland is just another way to adorn your door! Another example of keeping it simple with symmetry and fall colors! 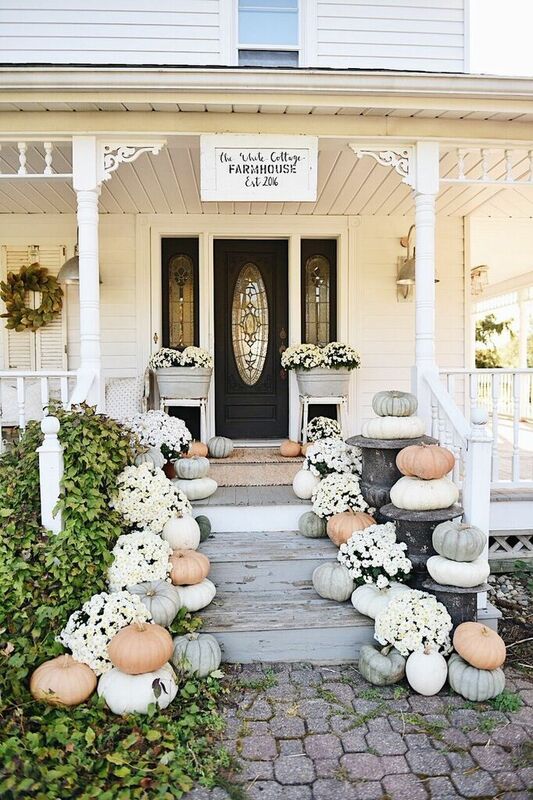 Two matching planters, filled with fall foliage and pumpkins, and a coordinating door wreath is all you need to recreate this look. Use a fall sign as the focal point of your porch! A tall skinny sign is perfect for small porches and you can layer pumpkins or mums in front of it. This porch uses shades of white and green and a symmetrical arrangement to perfectly compliment the turquoise door and the shape of the porch. Another great example of neutrals and a super simple set-up using hay bales, lanterns, metal planters, and plenty of pumpkins! Pops of bright orange and gold mixed with rustic elements gives this porch a unique feel! I especially love the beautiful shades of deep green that are mixed in with the wreath, plants, and pumpkins. An all-white and super natural look with a handmade pallet sign as the focal point. Add height with foddershocks behind your sign and then balance it out with a stack a crates, pumpkins, and mums on the opposite side of the door. Bright and colorful with tons of foliage and matching planters on each side of the door. I love the addition of the lanterns to the planters, and the strategic stacking around each planter using old crates, hay bales, and pots. A beautiful fall color scheme full of coppers, golds, ambers, and browns. You can turn haybales two different ways on each side of the door to create different heights for stacking items on top. Faux leaves, foliage, and sticks becomes perfect filler for both sides of the door as well. Another example of how to use a ladder for your porch decor- this time with a cute collection of plaid blankets! I also love the matching pair of wreaths and simple mix of baskets throughout the space. A gorgeous collection of all-white pumpkins and purple mums mixed with lots of lanterns, matching topiaries, and a coordinating wreath. Make a statement on your stairs by piling on the pumpkins and mums to line both sides. Mix and match all different colors or use a neutral pallet like they did above. 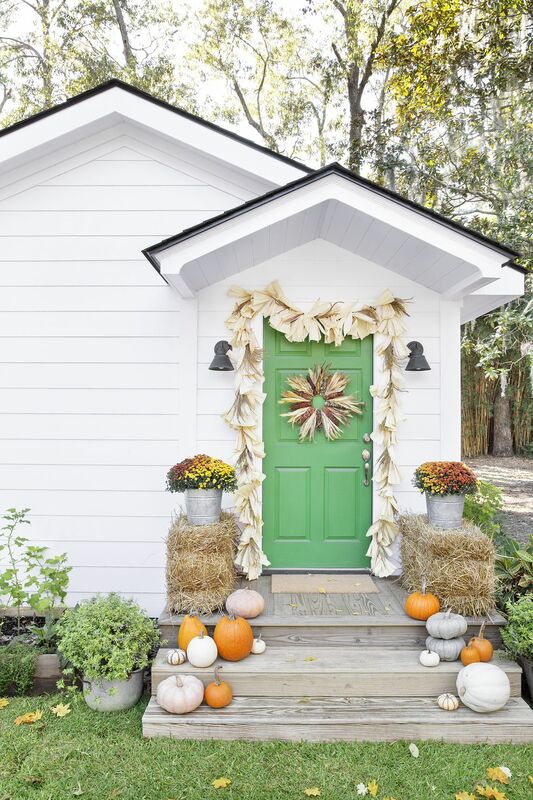 Another gorgeous green + white set up with garland adorning the doorway and pumpkins accessorizing the topiaries. A more scattered look aligning the stairs helps break up the simple symmetry happening on each side of the door. Create a rustic and boho vibe with lots of layered foddershocks and pumpkins mixed in with vintage furniture and accessories. I love how they used a vintage macrame owl on the door in place of a traditional wreath. A super simple, rustic set up using metal and wood elements mixed together. You can fill in and add height to planters using sticks and branches found in your yard. Another symeetrical set up using a mix of neutrals and oranges, as well as metal and wood planters. If you have the space, a giant wreath makes an amazing centerpiece for your porch decor! It's also especially cozy to add some seating mixed with blankets and pillows. Another great example of a cozy seating area using a hanging porch swing. Accessorize all around it and on it using pillows, throws, rugs, pumpkins, mums, and more!